Thousands of people around the world signed a petition against Delta's ban, which went into effect on July 10. The airline prohibited all pit bull-type dogs from flying on their planes as service or support animals. Now, the company is facing backlash worldwide. At Mineta San Jose International Airport, a professional service dog trainer said he understands the airline’s pit bull concerns but blames owners for skipping the right kind of training. It's not the breed, he said. "Pit bulls are not more dangerous than other dogs," said Franck Kangah, a professional dog trainer. "I've seen little dogs that were more dangerous than other pit bulls." The U.S. Department of Transportation told NBC Bay Area "a limitation based exclusively on breed of the service animal is not allowed under the department’s Air Carrier Access Act." Gisselle Nuñez, the owner of a full-breed, blue nose pit bull named Murphy, says the Delta ban gives the breed a unwarranted bad wrap. "The question is, Delta Airlines: What is your criteria for banning this particular breed?" Nunez said. "Show us the research, show us the facts, but don’t perpetuate negative perceptions." 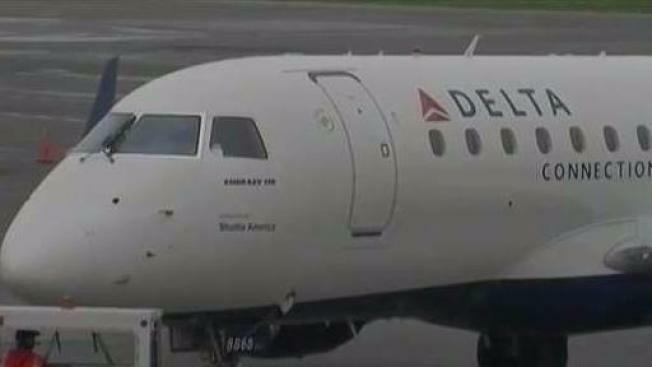 The airline has reported that some of its employees were bitten by pit bulls on flights. Kangah, who trained Murphy for 10 months, said he understands Delta’s concern but argues it’s the owners’ fault for failing to put the dogs through the right training. "Without the proper training, like true, proper training of a service animal, you’ll have accidents like that of a dog biting another dog or even a dog pottying inside a plane," Kangah said. "If you see the obedience, you automatically know, that is a service dog. You can see the difference between a really trained service dog and not a true service dog." Southwest Airlines does not restrict pit bulls on its flights, the company said in an email to NBC. JetBlue doesn’t address specific breeds within its pet or service animal policies. Pit bulls cannot be brought onto American Airlines planes as checked luggage but are allowed to be on the company’s planes as service animals or paid pets, a company spokesman said. The Department of Transportation (DOT) says it is looking into possibly changing the rules for service animals on flights and has received more than 4,000 public comments on the issue. Right now, airlines can refuse service animals if "there are factors precluding the animal from traveling in the cabin of the aircraft." Such factors include the animal's size and weight, whether the animal would pose a threat to the health and safety of other passengers and whether it would cause a significant disruption of cabin service, the DOT said.